Looking for a Jewish wedding document that speaks to you and your values? 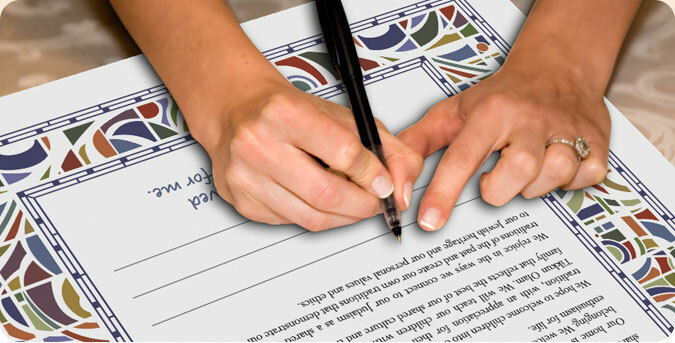 BuildAKetubah.com allows you to customize a document including the sentiments you would like. Our ketubahs reflect a contemporary and modern Jewish voice. They are perfect for unaffiliated Jews, Reform Jews, secular Jews, humanistic Jews, and interfaith couples looking to capture their most important feelings on their wedding day. They are incredibly customizable! Each ketubah has a standard introductory paragraph followed by five sections (love, marriage, home, family, and tradition). In each section, you’ll be given multiple choices and will be able to choose the 2-3 sentences you like best. You’ll also choose the graphical elements and a biblical phrase for the top of the ketubah. We’ll send you a proof so you can see what it all looks like before we send it to the printer. Our standard ketubahs are 16X20” and are archival quality giclee prints. You may view sample texts here. Once you are ready to order your ketubah, you’ll be charged a $50 deposit and then will go through the process of building your ketubah from the elements provided on a simple online form. Once you approve your online proof and choose to have it printed, you’ll be charged an additional $225. Please try to order your ketubah at least 2 months before your wedding day. For rush services, please contact us by email at ketubahs@ourjewishcommunity.org.